Acne… it’s something that no one looks forward to but have experienced at some point in their lives. I battled with minor acne during my teenage years and then again sometime in my early twenties. I’m not sure what caused the break outs to happen, but trust me, it wasn’t a fun time. I remember I went twice weekly for a facial and treatment for three straight months until it all cleared up. That was a lot of time and financial commitment, however… totally worth it. I’m happy to say that I no longer struggle with long term acne, however, during that .. ahem… time of the month, I still get attacked by the occasional blemish, and sometimes, they are so deep and sore. So how do we treat Acne not only at the onset but how do we introduce a preventive daily regime to fight them off? Thanks to La Roche-Posay, I had the pleasure to get educated around acne and the products in the market to help both treat and prevent. Acne doesn’t stop at just the inflammation. Post inflammation, they leave red (generally people with phototype I and II, fair skin) or brown (generally people with phototype III – VI, dark/tanned skin) marks that frequently take months to disappear and hard to treat. Good news, La Roche-Posay launched its innovative product earlier this month, Effaclar Duo [+] which provided duo performance of fighting acne and clogged pores and treating acne marks. Effaclar Duo [+] is a meant to be used as a whole face application best for teenagers, those who are suffering from mild to moderate acne, and mainly on the T-zone/forehead areas. This product is alcohol-free, colorant-free, paraben-free, oil-free, non-comedogenic, and physiological pH, perfect for those with sensitive skin. I’ve personally been applying Effaclar Duo [+] only on areas that I generally experience acne, i.e. T-zone and chin area and combining Effaclar A.I. as a spot treatment solution. I’ve seen effectiveness within 24 hours of application, which is awesome! 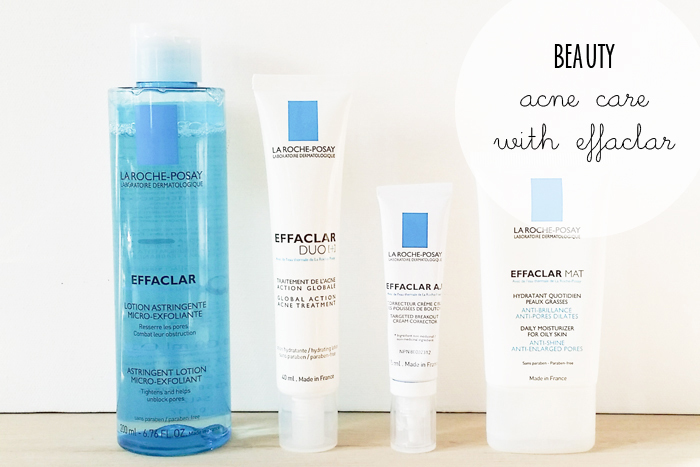 Effaclar Duo [+] is best used with La Roche-Posay’s Effaclar line of products. I’ve been cheating a little wee bit and have been using my regular night cream from Elizabeth Arden (which I also love). However, I’m happy to share my acne-care regimen over the past several weeks. 1. Remove Eye Make-Up (I like this eye make up remover from Sephora). 2. Cleansing both day and night with Effaclar Purifying Foaming Gel – super mild and formulated for sensitive skin. 3. Tone both day and night with Effaclar Micro-Exfoliating Astrigent Lotion – this also removes excess make up. 4. 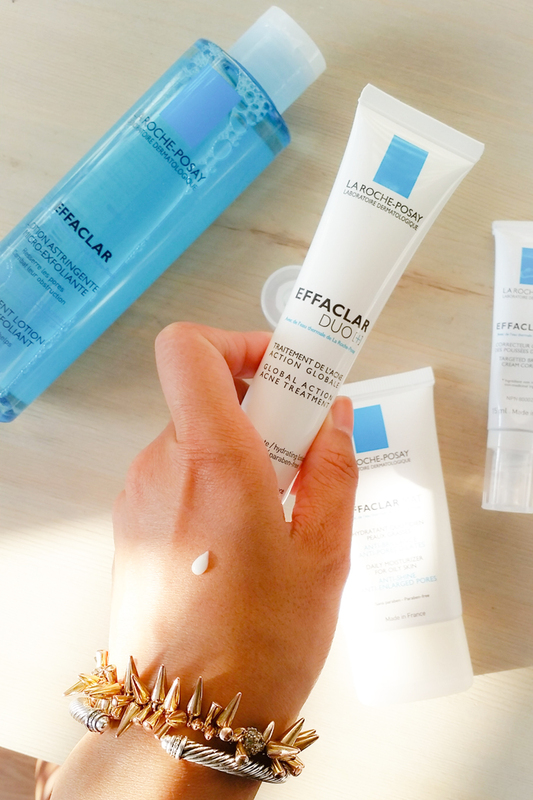 Apply La Roche-Posay Pigmentclar on dark spots – I talk about Pigmentclar a couple months back. 5. Apply Effaclar Duo [+] on acne-prone areas – preventative. 6. Spot treat acne with Effaclar A.I. 7. Moisturize – day time I use Effaclar Mat (perfect for my oily skin), night time I am still sticking to my Elizabeth Arden Prevage night cream. I hope you found some of these tips useful! If you are struggling with acne, I 100% understand it causes a high impact on the quality of life. I your acne is mild to moderate, I really do recommend giving this line a try! Can I use effacular duo with the pigment serum. Hi, I’m also using the pigmentclar and effaclar duo+ like you did and i also feel my skin got beter after using it.. Now I’m going to try the effaclar mat moisturizer and wondering whether u apply the duo+ before the mat or just use it seperately? Thank you! Btw, your blog is really helpful!???????? 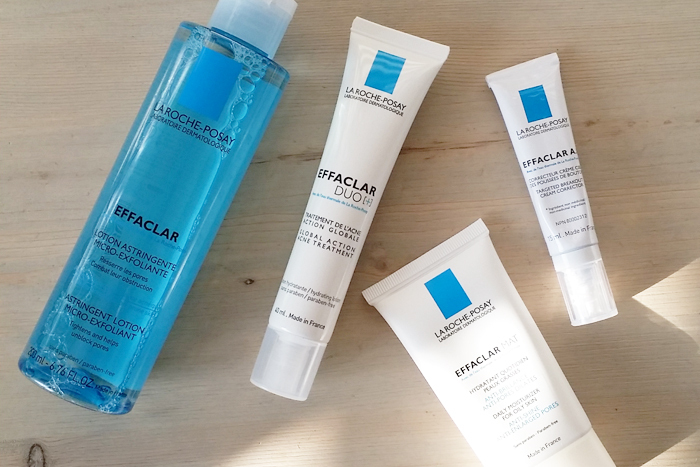 I heard a lot of good things about La Roche-Posay skin care products. I haven’t tried them yet, but my sister recently sent me the Effaclar A.I for spot treatment. Said it is by far the best product she used to get rid of acne fast and safe. I haven’t opened the box yet, no pressing need so far, but I’ll give this a go, and if I like it, I’ll get myself the rest of the products on your list. Thanks for sharing! This information is truly helping me dial in my skin care regimen. I have a quick question for you: I generally don’t wear any makeup, so I am wondering if I need to use a toner. In the past it has made my skin feel dry and tight, so I’d like to skip it. What are your thoughts? Thank you!